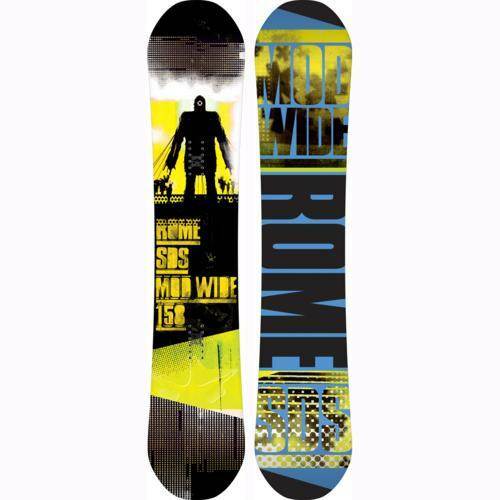 The Rome Mod is a stiff aggressive all mountain freestyle snowboard for people who like to go big in the jump park and the back country. 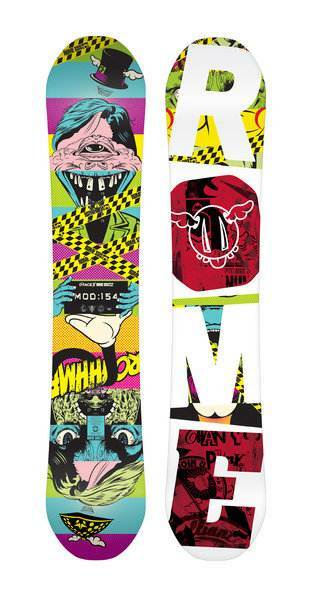 This is an aggressive, poppy camber all mountain freestyle board that is especially great when it comes to jumps of all sizes. The 2015 Rome Mod had a make over in terms of design but still has the same general poppy aggressive personality it’s always had. Now the waist width’s get progressively wider as the board get’s bigger and it’s a little better for those in between a mid/wide and regular size. Also it has a new tip/tail design that goes from a small blunt to a more penile look than before. It’s unique in it’s own phallic way. Conditions: Mostly firm to soft groomed snow with only a day with about 1 foot of soft wet thick sierra powder. 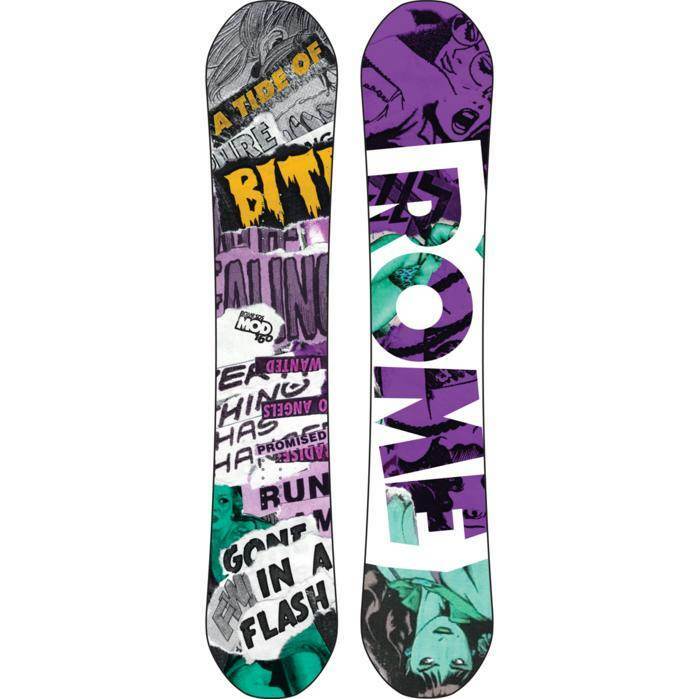 Boots: Burton Ion, Burton Driver X, Rome Libertine Pureflex. In 2010 the Mod was a more park friendly version of the Rome Design. Like the Design it’s mainly for expert riders but an advanced rider can hang with it. The Rome Mod’s from the last few years haven’t changed much. For 2011 the Rome Mod has a few new tricks. The one that we like the most is the metal impact plates were replaced by Kevlar. We feel this is a nice change and does affect the flex of the board in a good way. In 2012 the Mod has some additional pop tech added but it’s very similar to the 2011. 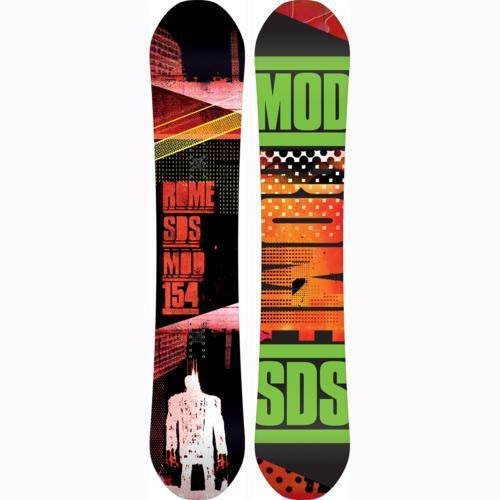 The Mod Wide is gone for 2012 as well but you can get it from the new Mod Rocker. The 2013 & 2014 Rome Mod hasn’t changed much. 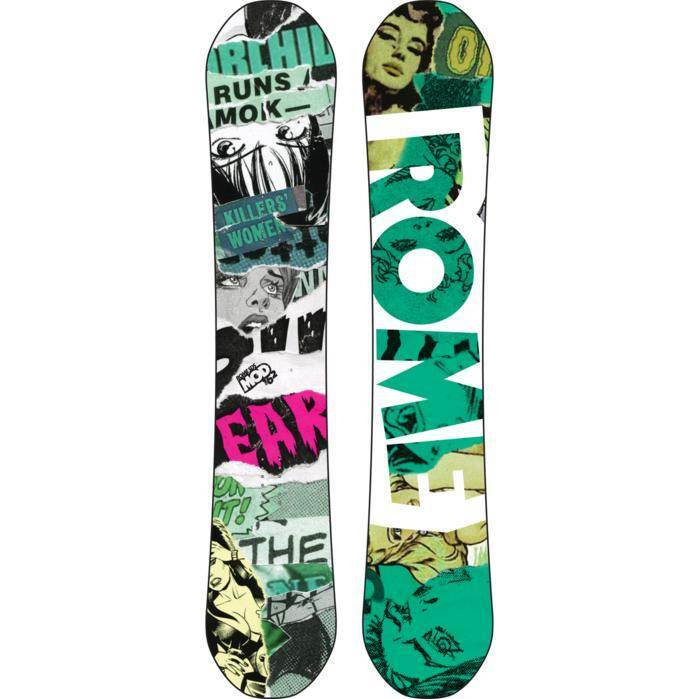 On Snow Feel: The Rome Mod is a pretty good all mountain freestyle board and like all camber boards has a stable but kind of catchy feel to it. 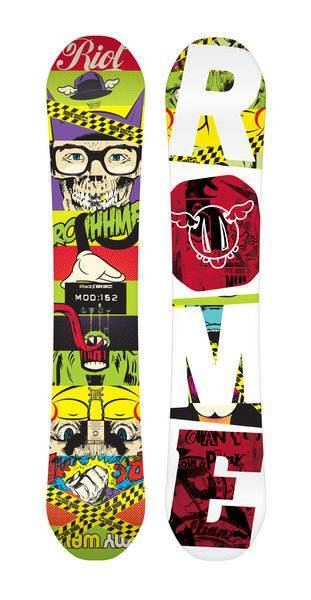 It’s all about hitting jumps with this or touring the mountain and looking for things to ollie off. Turn Initiation and Carving- We found this board to be much more difficult to turn compared to other boards of this size. Something was missing when making turns of all radius. 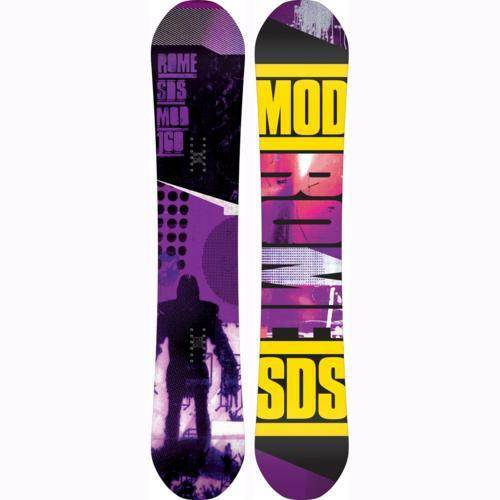 The Mod with it’s wider than average waist and mellow side cut is more content to go straight. 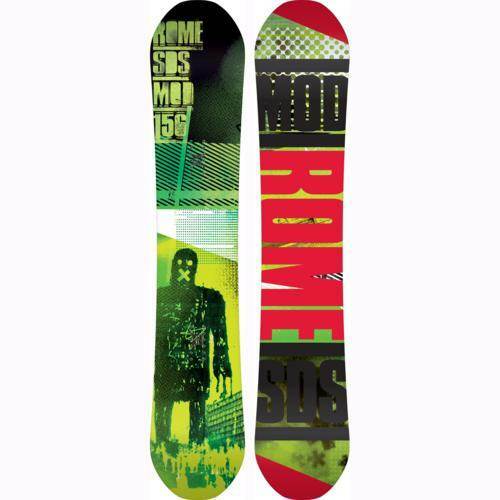 It does ride bigger than boards it’s size and can turns at high speed better than most small twins. It doesn’t have the soft and playful tight turning feel like most twins but it does have a more serious speedy feel that many will appreciate. The work it takes to transition from edge to edge was not what we expected but it does a good job on edge. Another reason most people who aren’t that accomplished will not like this board. You can lay into a carve but it didn’t want to make that liner kind of turn that many camber boards can provide. It seemed like it was angry at you for making it turn so hard. Speed: This is about as fast as a light true twin can get. This thing can bomb! 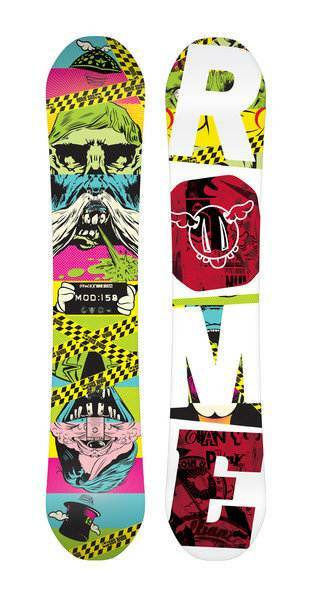 The stiff mid section of this board really absorbs chatter and likes to go straight. The base is fast as well. There are no issues flat basing. Uneven Terrain: Not bad here. 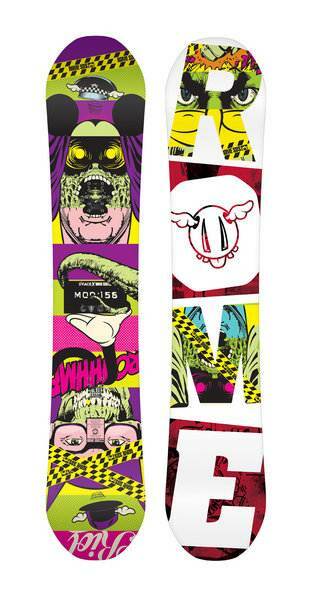 It’s better when you pair this board with some shock absorbent bindings like the Cartels or 390 Boss. 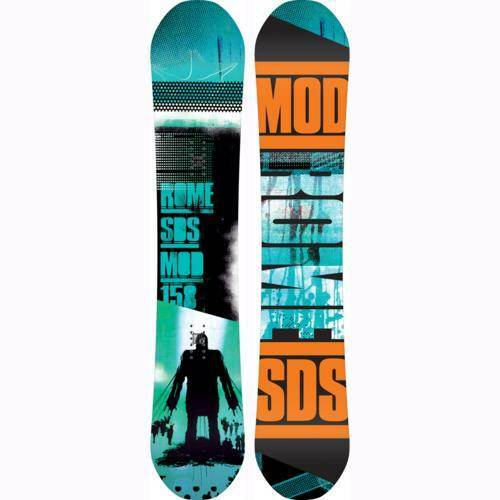 If you are riding bindings without much shock absorption the ride could feel a little tough on your body in bad snow. Approximate Weight– Very light! 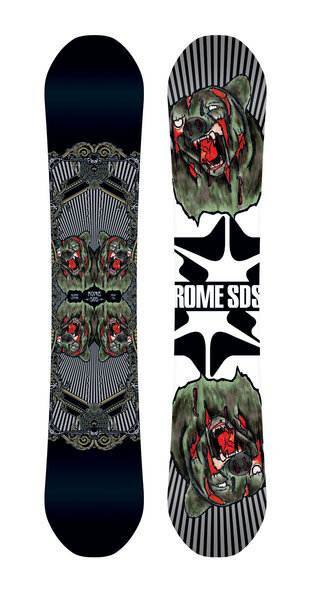 Pair this with some light bindings and you will have no issues on a super long chair ride. Very easy on the knees and ankles. It does feel like it could be fragile though as this is a problem with many super light boards. Edge Hold: The Rome Mod can hold an edge pretty well but the Mod Rocker with it’s extra something going on in the side cut (quick rip) along with the flat profile between the feet won out. It’s not an edgless board but the older camber boards with side cuts that don’t have an extra something going on usually loose these days to boards like the Mod Rocker when it comes to edge hold. 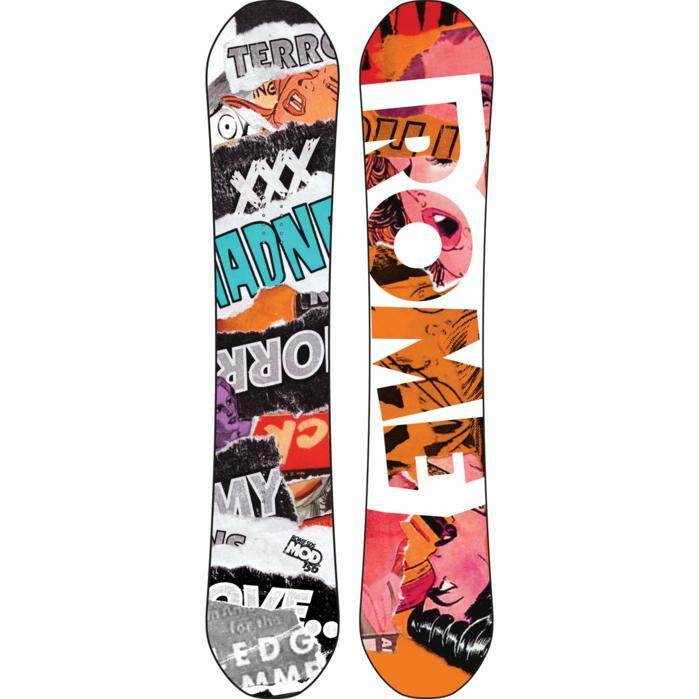 Flex– It’s pretty stiff in the middle but very soft at the tip and tail. Not bad for a butter or press when fooling around at slower speeds on the mountain. 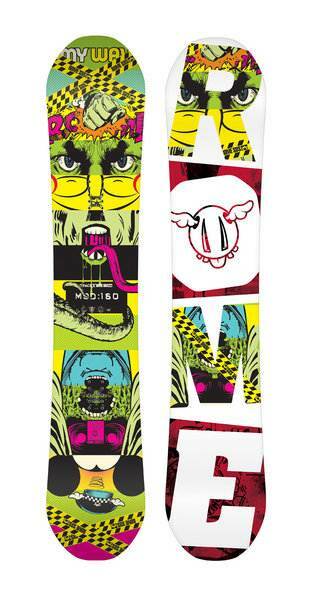 Jibbing- For a stiff board this does rather well. The 2 degree edge bevel allows you to have a little of each side of the park fence. The only issue is the light weight design comes at a cost. It just cant handle day after day of banging around in the jib park. 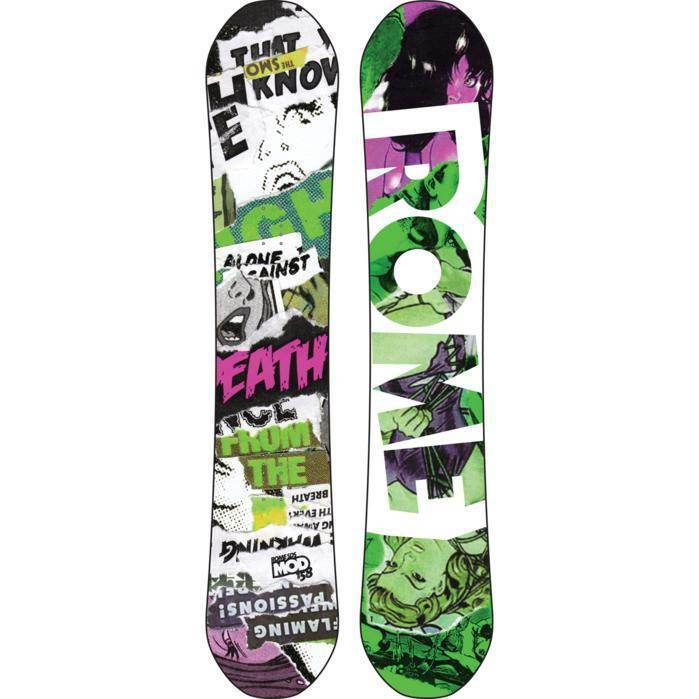 It will destroy the board rather quick. Pipe: Not the best pipe board but it can get up and down the walls. It has a better drive carving from wall to wall but something is off that makes it a great pipe board. 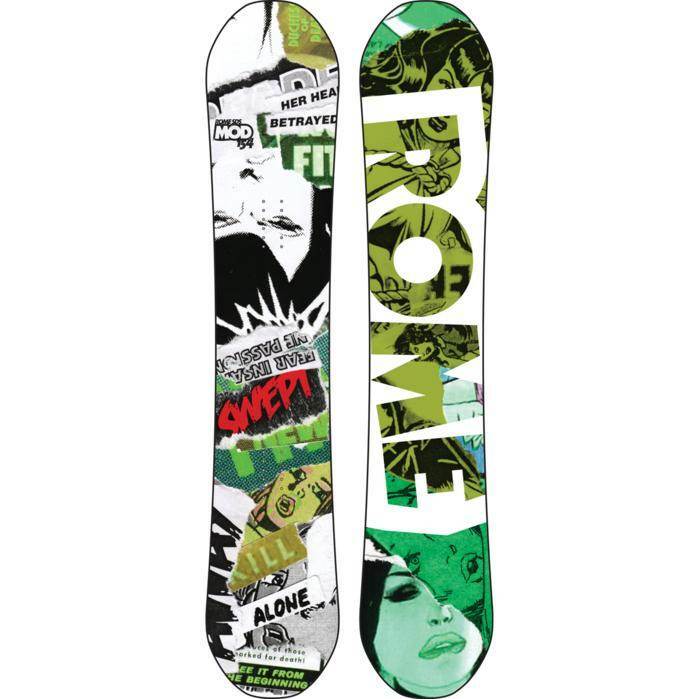 Maybe it’s the same reason it’s lacking a bit for a camber board in a carve. what ever it is the pipe is ok but not great. Jumps: This is the Rome Mod’s best quality. That stable wana go straight feeling of this board that is a little off in the pipe shines when you are about to hit a big kicker. 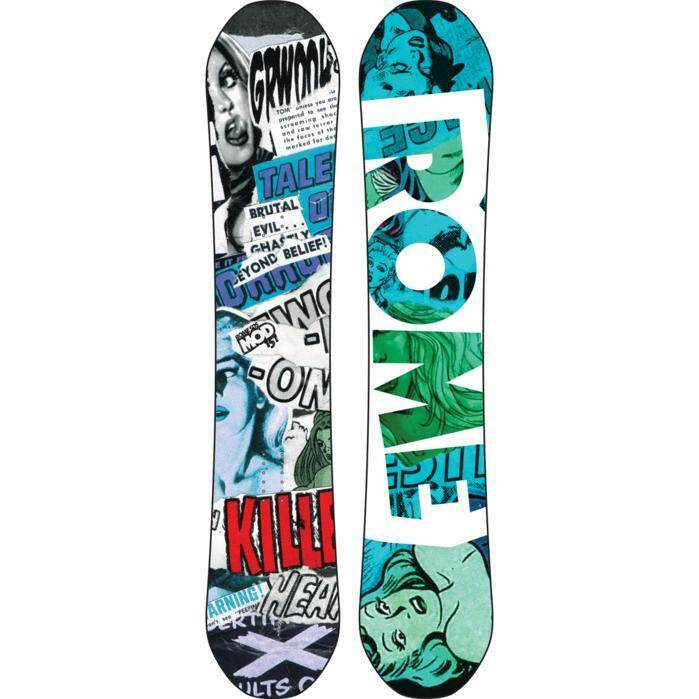 If you live for jumps then here is one of the better board out there. If you like to ollie off things around the mountain the Mod is pretty springy. Each year they work on making this better so the Mod slightly improves it’s spring/pop. The newer the better but don’t shy away from last years model if it’s on sale. 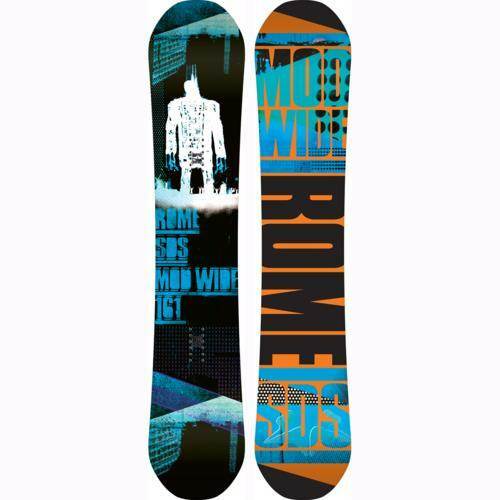 The Rome Mod turned out to be a lot different than what we expected but our conclusion is that Rome has another fun but very aggressive freestyle board that isn’t made for the faint of heart. We try to get as many images of the Rome Mod, but forgive us if they're not all there.